The Olympics begin in less than two weeks, and you will spend a fortnight obsessing over athletes and sports you won't think about again for another four years. (If then.) To prepare you for the big games o' London, we're showcasing a different athlete every weekday until they begin. Today: Oscar Pistorius. You might know him from: Here's your moving soft-focus Bob Costas–narration story. (Actually, this feels like a Jimmy Roberts montage.) 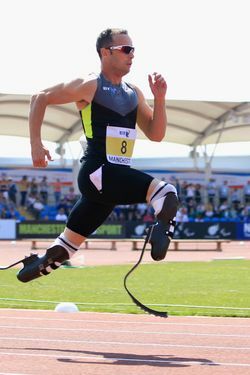 Pistorius had both of his legs amputated when he was a baby, and he runs using "Cheetah Flex-Foot carbon fibre transtibial artificial limbs." It's pretty badass. There have been some protestations that Pistorius has some sort of unfair advantage with his artificial limbs, and we respond by encouraging those protesting him to chop off their legs as well, so that they might have the same "advantage." Most embarrassing public moment: You can tell Pistorius has hit the big time because the Post is running items about him dating models. Most proud public moment: He won three golds at the 2008 Paralympics after being left off (unfairly, say some) the South African 2008 Olympic team. What to expect from him this year: He's unlikely to medal, not that anyone is going to care. Odds that you'll remember his name in four years: You'll probably just know him as "that guy with no legs that made you cry four years ago," but yeah, you'll remember. And you'll definitely remember his nickname: the "Blade Runner." We desperately want someone to call us that someday.